Gives us another $8M in cap space. It's no surprise, really. With the emergence of Nassib no surprise. They did him a solid by releasing him now. Sounds like he wanted to hit free agency as early as he could. We didn't make cuts last year until March. Expected. 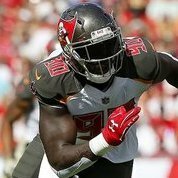 Bucs need to be creative creating cap space and filling in the holes.